Join us on Saturday April 11th at 7:30 PM for a film screening and discussion on the life and death of Aaron Swartz, and the ethical, legal, and personal issues that his story raises. 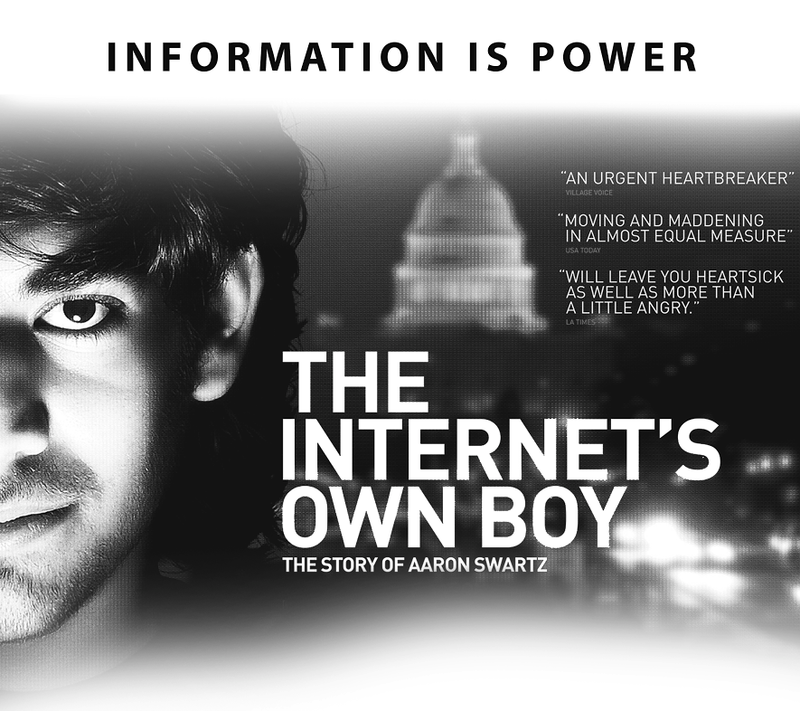 The Internet's Own Boy: The Story of Aaron Swartz, is an American biographical documentary that premiered at the 2014 Sundance Film Festival, depicts the life of the American computer programmer, writer, political organizer, and Internet activist. A discussion will be led by Dr. Lance Strate, professor of Communications and Media Studies at Fordham University. Open to the public. Free admission. Light refreshments served. And there's still more, but that should suffice for now! From Congregation Adas Emuno to you and yours, and to all the world: Best wishes on this, the Season of our Freedom! A sweet and happy Passover all around the world! Just a reminder that there will be no Shabbat services at our shul tonight. That almost never happens, but once in a decade or so, the first Seder falls on a Friday night. And there will be no Torah study tomorrow morning because we will be taking part, along with other Reform congregations in our part of Bergen County, in the community festival morning service at Temple Beth El of Northern Valley, at 10:30 AM. And for those of you who reserved a place at our Congregational Seder right here in Leonia, tomorrow evening at 6 PM down in our social hall, we look forward to seeing you there! The death of Leonard Nimoy on Friday, February 27, at 83, marked the passing of an American icon—indeed, a star of global renown, and a Jewish hero as well. Nimoy’s accomplishments were many. He was an author, poet, musician, photographer, philanthropist, educator, and director, and of course an actor who played many roles on stage and screen. But he is best known for his role as Mr. Spock on Star Trek, the television series that first aired in 1966. It is a role he reprised in the various sequels, spinoffs, and remakes that appeared after the original series went off the air in 1969. Nimoy was a Boston native, fluent in Yiddish, whose parents were Orthodox Jews who escaped from the Soviet Union. As he related in various interviews, his background informed his portrayal of the sole alien being on the Starship Enterprise. Spock hailed from the planet Vulcan but was also half-human, making him an alien on Vulcan as well. His status reflects that of immigrants and their children, first-generation Americans who, like Nimoy, grow up in a household, community, and culture that still has one foot in the old world. 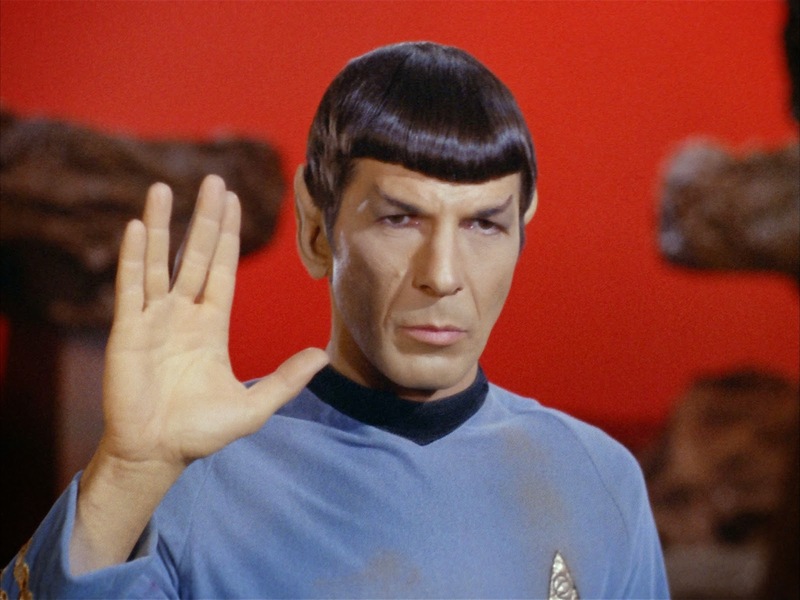 As a child attending Orthodox services, Nimoy observed the Cohenim delivering the priestly benediction, and as an adult he appropriated their hand gesture when he introduced the Vulcan salute. The greeting that he added to the salute, “live long and prosper,” echoes the sentiment of the benediction, as well as the simple greeting “shalom” (further echoed in the ritual response, “peace and long life”). There is certainly cause for pride in this small Jewish contribution to global popular culture, but does this mean that Star Trek incorporates Jewish undertones, as Haaretz writer Nathan Abrams insisted in an article published the day after Nimoy’s death? Certainly, Jewish fans can take pleasure in the fact that Nimoy and co-star William Shatner are Jewish. So were several of the series’ writers, and we can assume that they all brought some elements of a Jewish sensibility to the program. But let’s be clear that Star Trek was created by Gene Roddenberry, who was not Jewish, and who included characters from a variety of different backgrounds—Scottish, Irish, French, Italian, Russian, Japanese, and African—but never one who was identifiably Jewish. Indeed, the only characters with any real Jewish identity in the Star Trek universe appeared in a few of the many original novels published under license from Paramount Pictures. No doubt this is not because of any bias or prejudice on Roddenberry’s part, but rather because he associated Jewishness with religion, rather than nationality. His vision of the future was one in which science and progress reigned supreme, and any seemingly supernatural phenomena would inevitably be revealed to be a product of a highly advanced science, or biological evolution. The conspicuous absence of any Jewish characters from Roddenberry’s melting-pot future can lead viewers to search for them in disguised, symbolic form, to look for what Sigmund Freud referred to as the return of the repressed. And the obvious form for a crypto-Judaic character to take would be that of an alien being. Indeed, while Shatner had the kind of looks that allowed him to pass as a WASP from Iowa, Nimoy’s features gave him what was considered at the time to be a relatively interchangeable “ethnic” appearance, so that earlier in his career he played Spanish, Mexican, and Native American characters. And certainly there are Jewish elements incorporated into Nimoy’s man from Vulcan, and into other aspects of Star Trek. Consider the episode called “Patterns of Force,” in which an alien planet patterns itself after Earth’s Nazi Germany, and is trying to wipe out their neighboring planet, called Zeon (an obvious reference to Zion). But I want to suggest that Abrams and others are wrong about Spock being implicitly Jewish. It perhaps is revealing that Abrams mistakenly refers to the character as “Dr.” Spock, a mistake not uncommon among those not very familiar with the series. Nimoy’s character usually is referred to as “Mr.” Spock, in keeping with naval tradition about first officers, and occasionally by his rank, which was at various times commander, captain, and ambassador. 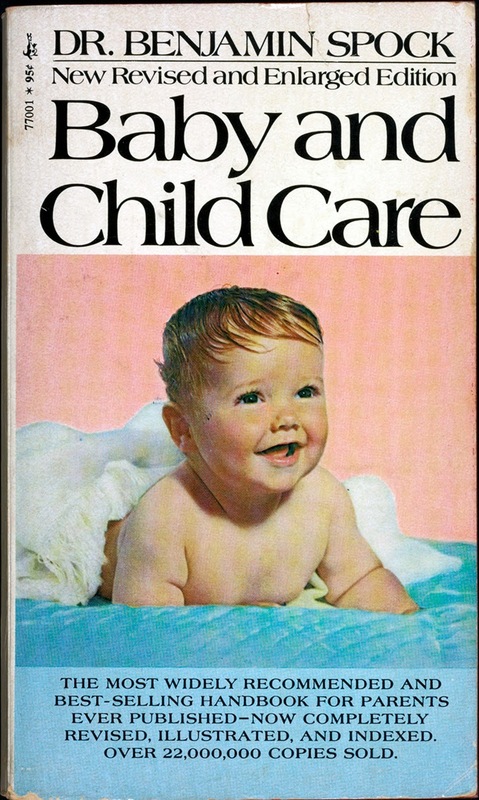 Dr. Spock was, of course, Benjamin Spock, the famous pediatrician whose bestselling book, Baby and Child Care, served as a bible to the parents in the postwar era. Like Roddenbery, Dr. Spock was not Jewish. The name Spock is Dutch, originally spelled Spaak. Spock’s home planet, Vulcan is named for the Roman god of fires and forges, and Vulcans are revealed to be related to another alien race, the warlike Romulans, named for the founder of Rome. Vulcan philosophy, which venerates logic above all else, represents a view that is very much in keeping with Athens rather than Jerusalem. Vulcans revere Surak as the founder of their philosophy. Surak has little in common with Moses but quite a bit with Socrates, with some Gandhi thrown in for good measure. So while Spock’s home planet is depicted as having the kind of hot, dessert-like climate that we associate with the Middle East, the stronger connection is to the European side of the Mediterranean. Abrams associates Vulcan intellectualism with the people of the book, but the aliens do not seek a balance between faith and reason, in the fashion of Maimonides, but rather enforce a strict discipline, suppressing all emotion, in a way that is very much in keeping with another branch of ancient Greek philosophy, Zeno’s Stoicism. Moreover, suppression of emotions often is linked to dehumanization, as a means of forcing individuals to adapt to mechanization and industrialism, yielding a technological being well suited to being a cog in a machine, rather than a mensch, a real, well rounded human being. We may therefore identify with Spock’s struggles, and admire his superior physical and mental abilities, but it is his human side that is the most Jewish part of him. Following a long tradition in western culture, Roddenberry used orientalism to convey a sense of the alien, and this includes Jewish as well as Arabic, Persian, and Chinese elements. With his raised eyebrows, Spock bears a certain similarity to Ming the Merciless, the alien villain from the old Flash Gordon serials. But it was not until long after Roddenberry’s death in 1991 that a Jewish film director, J. J. Abrams, who was recruited to reboot the series, invokes the destruction of the Temple and subsequent diaspora by having the planet Vulcan destroyed by Romulans. In that 2009 film, called simply Star Trek, time travel is used to generate an alternate timeline, and Leonard Nimoy makes a cameo appearance as the original, now-elderly Spock, while Zachary Quinto takes on the main role as the new Spock. (Quinto is of Italian ancestry, and Italians and Jews often have been cast interchangeably in film and television.) 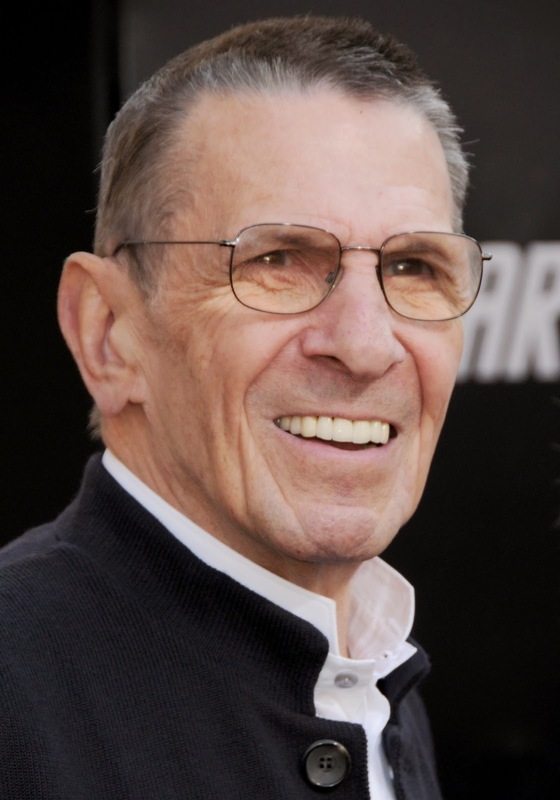 Nimoy’s final film appearance was in the 2013 sequel, Star Trek Into Darkness, also directed by Abrams.